Towmaster takes pride in the quality construction of its products. 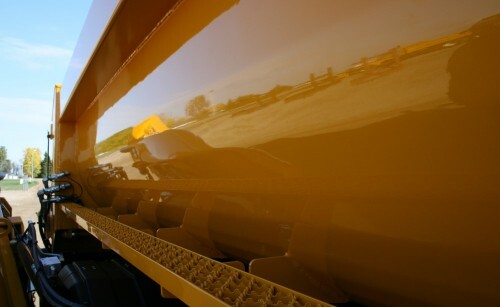 Our truck division draws upon the experience of people who have been building and selling truck equipment for decades. This experience translates into features that differentiate us from our competition, giving you a product with durability and quality you can see for years down the road. Here are some of the features that give Towmaster built truck bodies the EDGE. Precision laser-cut parts throughout the body provide aesthetically pleasing finish as well as guaranteed fit and function. No unsafe jagged edges or rough appearance. Upper grab handle and interior step are standard items with Towmaster Flip-A-Way access ladders. Towmaster’s upper gate hinges and corner post supports are the strongest in the industry. The same components utilized on our Tandem-Axle bodies are found on the Single-Axle applications. Our hinge ears and support ears are precision bushed for added bearing surface. Our pins are 1-3/4” diameter with grease points and supported with heavy-duty 3/4” plates that are welded all around to the heavy corner post top cap. Towmaster’s lower latch assemblies shadow the competition; boasting ½” thick dual pin saddles (compared to 3/8” on most brands), and 1” greaseable latch fingers accessible directly outside of the body. The Towmaster tailgate overlaps the rear cargo opening and provides a blunt edge for sander spill plates to engage tightly so no salt will leak between the tailgate and the sander spill plates during sander operations. The rear bolster on a Towmaster body is no wimp either. Made of structural channel (most others are formed sheet steel), you get the added strength from a mill extruded product, providing thickened corners to ward against cracking or fatigue. 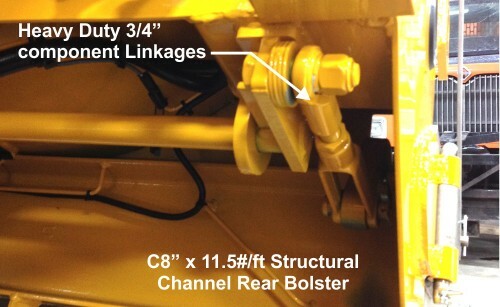 The linkage is the strongest and most rugged in the industry. Made with 3/4” adjustable components, the dual over-center lock ensures tailgate securement even with liquid type loads. The heim joint boasts a Teflon-lined bearing for maintenance-free usage. When you order “struck sides” from Towmaster, you get more than just a raised side height with a self-cleaning edge. Towmaster goes the extra distance to provide you with added strength and impact resistance. The Towmaster top rail is fully boxed with 3/16” Grade 50 material and then CAPPED with an inverted structural angle-iron for self cleaning purposes. 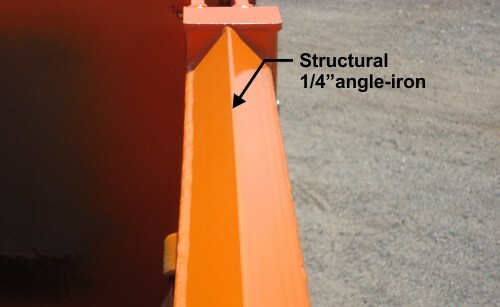 This angle will ensure that you do not dent or crush the top rail if hit by the loader bucket, unlike others will that are simply formed into the top rail. Every Towmaster tailgate is constructed in a 2-piece (laminated) fashion. The inner panel is constructed of Hardox-450 material. The outer skin/braces (vertical & horizontal) are formed out of 10 gauge Grade 50 material (compared to 12 ga. on most others). 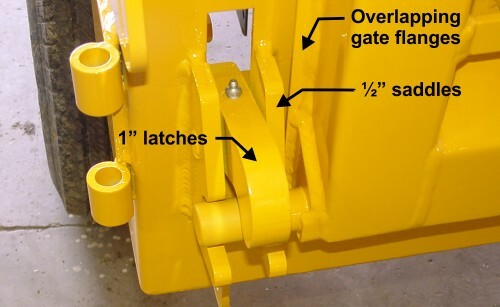 The spreader chains are easily replaced if they become stretched or broken. Most other brands weld the chains to the gate. Towmaster’s serviceability is of utmost importance. Dual safety props are integrated into the hoist and lock in place to eliminate alignment issues so the props self-align every time! No “pockets” to fill with debris, and no rust build-up to contend with. 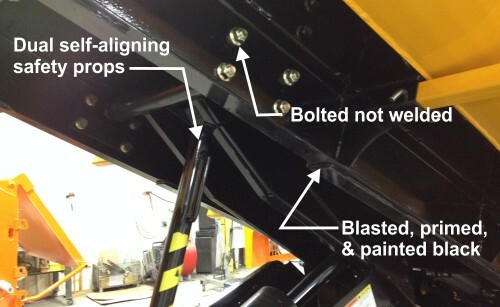 The hoist is bolted to longsills, not welded, for future servicing or body removal if needed. Understructure is blasted, seam-sealed, primed and painted with gloss black polyurethane for superior longevity. Towmaster’s TMTE-1 D.O.T. all LED warning light system gives you added benefits over most others in the market. The rear warning light has 40% more LEDs than most, and also interchanges with the Micro-Edge (front) light heads. The elimination of filament type bulbs prolong the life of the system. Our stainless steel housings allow for a full-sized marker light to be mounted in the cornerpost. Work lights are high intensity LEDs cased in a waterproof housing for maximum durability. Rust pockets are eliminated on the cabshield canopy by integrating a flat attachment surface for the adjustable strobe tube mount and eliminating a front lip on the canopy. 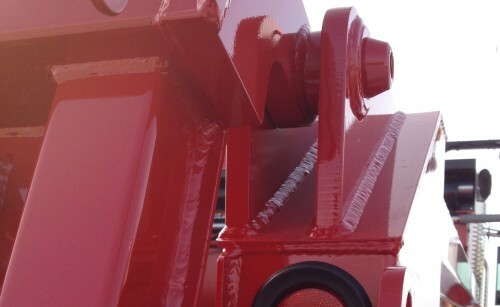 All welds are seam-sealed after blasting, polyurethane primed & polyurethane painted, to ensure no pack rust can begin. All black components on our installations are shot-blasted, polyurethane primed, and polyurethane painted, to provide long life and resistance to salt-spray break down. Others simply use a 1-coat black over raw steel. 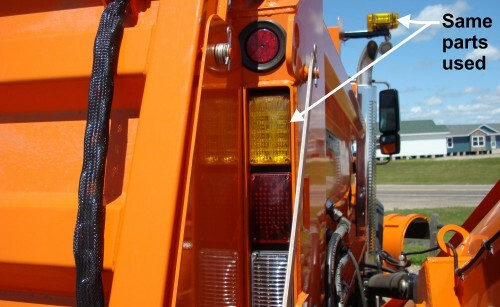 Towmaster’s standard plow light mounts are constructed from 3/8” aluminum. This design allows for a lightweight yet very strong mount. Others utilize a thinner stainless steel which addresses corrosion but vibrate and shake. Towmaster adds support braces as necessary to ensure the hood does not become compromised. H-O-H (High Output Halogen) Lights from Towmaster include separate High & Low beam bulbs for even brighter viewing of the roadway. Towmaster’s cabshield mounted reservoirs are constructed of stainless steel. The advantage of stainless steel is quite apparent when utilized in the harsh environment of salt and chlorides. This, combined with mounting to a hot-dipped galvanized tubular cabshield base, makes for the best corrosion-free system available. 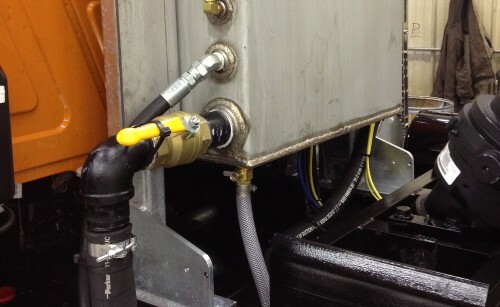 We don’t stop there; with every Towmaster cabshield mounted reservoir, you get a quick-drain valve and tubing plumbing to allow oil to run directly into a catch pan on the floor without messing up the frame area around the drain port. Yes, we do think about the mechanics in addition to the drivers! The body longsills are reinforced at the rear attachment point with fishplates and gusseted in the corners for superb strength. This area is the backbone of the dump body rear and must hold the entire body to the rear hinge point. All access holes are machine-cut into the longsills and reinforcing plates, welded continuously, and sanded for smooth edges. No worries routing hoses or wiring through these points. Jagged, hand-cut holes are not a part of a Towmaster body. All spaces between welds are seam-sealed after blasting and before primer and paint. The worry-free power center manufactured by Towmaster incorporates clean power to all accessory systems. 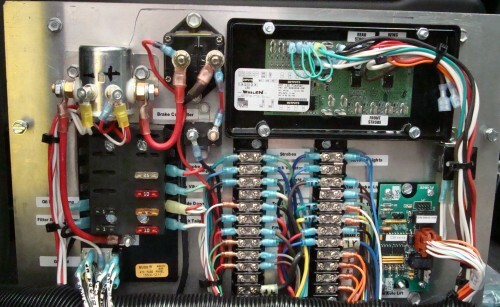 Our center incorporates a 100 amp breaker between the battery and the continuous duty solenoid. The OEM chassis body-builder plug provides the necessary signals we need to integrate into the body, hydraulic, and lighting systems. Our boards are precisely labeled at all connections (including the ground wires) for efficient troubleshooting, should an electrical problem ever develop. A photo record of each truck is kept on file. 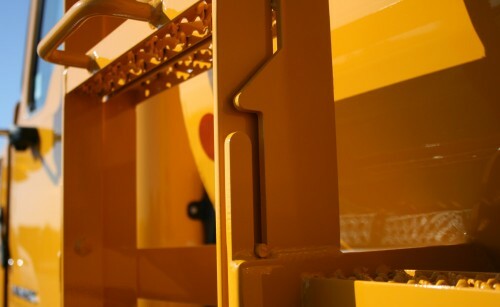 Integrity of the truck frame is foremost in Towmaster’s installation practices. Towmaster utilizes flange-head bolts and flange-head nuts through precision-drilled holes, eliminating washers which tend to break or compress leading to fasteners loosening up or shearing off. All components bolted to the frame are blasted, primed, and painted prior to final installation. 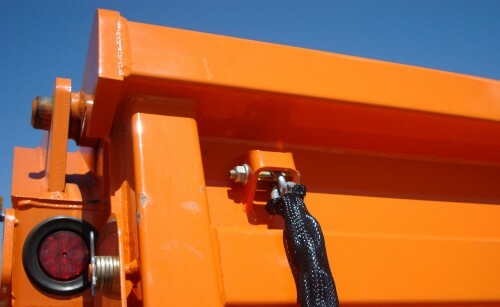 Towmaster does not use bare metal in contact with the truck frame to prevent rust seepage. 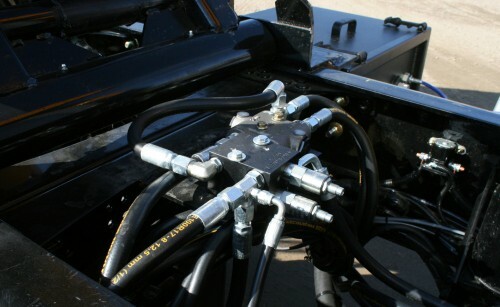 Towmaster utilizes the Parker Tough-Cover and Super Tough-Cover hose products. These hoses are 80 to 300 times superior to standard SAE100R17 hoses against abrasion, wear, and fatigue. The Parker “no-skive” crimp fittings bite into the outer wire layer for a positive crimp, with the last rib being a blunt (non piercing) type that squeezes the outer coating and provides a non-penetrable seal. 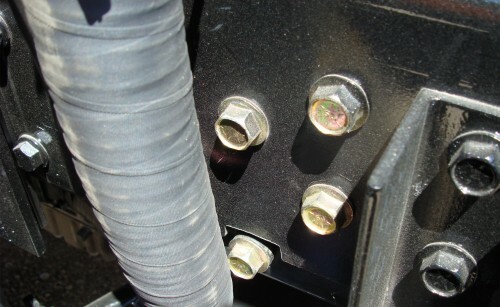 You do not have to worry about corrosion breakdown on our hose systems. Front Pump Mount The Front Pump Mount manufactured by Towmaster allows for good serviceability and provides protection for the truck as well as the individual. 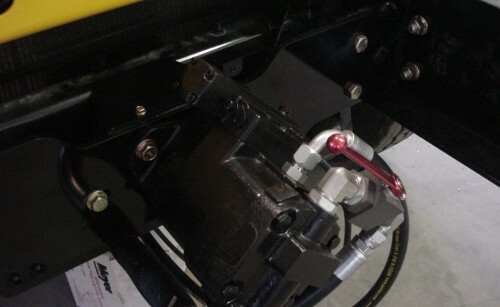 The driveline is surrounded by a hoop to protect the cooling components in the event of a failure, and the U-joint is protected by an overhead shield. Both are removable via bolt fasteners. All components are shot-blasted, urethane primed, and urethane painted gloss black for a long lasting finish. The Airtrip Cylinder is a large 3-1/2” x 10”-stroke, aluminum case, with 1” diameter stainless steel piston rod (the same cylinder as used on the H.D. Tandem Axle dumps). 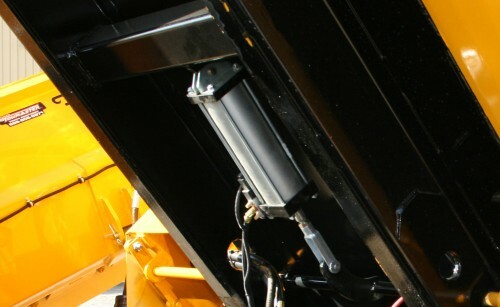 The cylinder is isolated from the floor and attaches to a crossmember at the rear of the dump body. Solenoid air valve is fitted with brass sintered exhaust mufflers which keep debris, moisture, and chemicals from entering the valve. Alternate mount for solenoid valve is in the hydraulic valve enclosure. Towmaster’s Stainless Steel Bodies carry the same design characteristics as their carbon steel counterparts, but with the majority of the body components constructed with stainless steel. 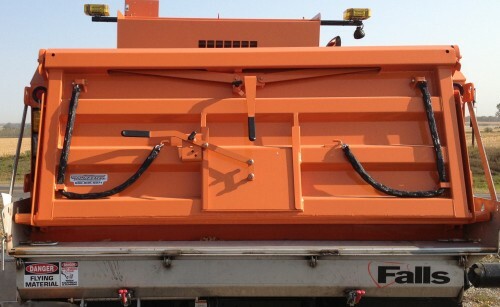 The floor and the interior face of the tailgate are constructed of Hardox® 450 material for longevity. The understructure is identical to a Carbon Steel Body and is blasted, seam-sealed, polyurethane primed, and polyurethane painted gloss black to ensure no hidden cavities are exposed to corrosion. Towmaster features the option of a Rear Access Ladder when the truck is equipped with an electric arm style tarp. 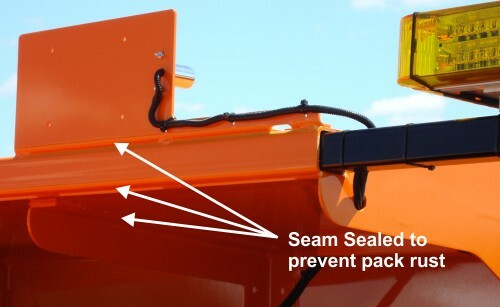 This ensures that entry to the box is done in a safe manner, keeping you from having to crawl over the tarp arms. This system can be on the curb or street side and works well with both pre-wet side tanks as well as wing and sander fit-ups. A lever top-pin release mechanism is a great option for any Single-Axle dump body, where lowering the tailgate is done on a frequent basis. It is available on all of the Carbon Steel, as well as the Stainless Steel Bodies. 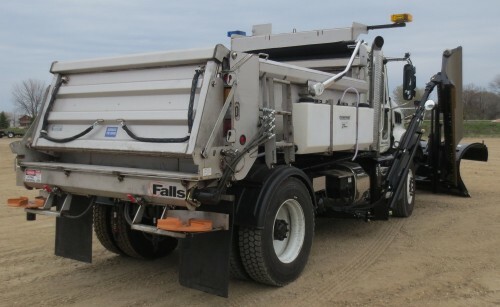 Another option is the “coal-chute” or metering door for distribution of chips or other products thru the rear tailgate. 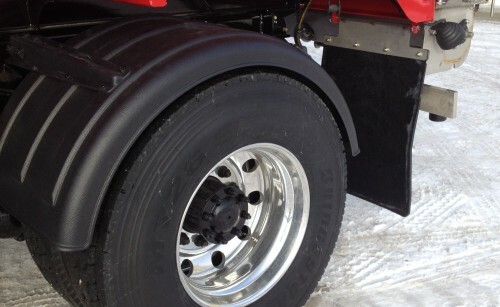 Towmaster utilizes stainless steel in all possible places, including our quick removable rear mudflap brackets. All mounting brackets for valves, toolboxes, and hose hangers are constructed of stainless steel. Minimizer poly fenders are the standard on most trucks because of their resistance to damage and their ability to shed ice and debris quicker. We also offer stainless steel and aluminum fenders as options. 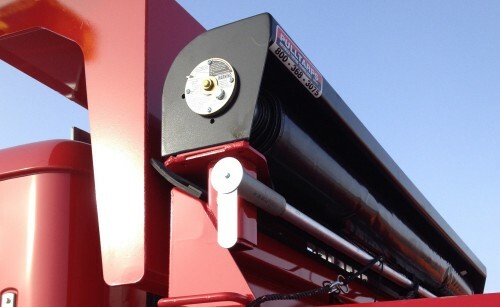 If a tarp system is part of your equipment package, Towmaster allows for good serviceability and easy removal of the main mechanism by mounting it on removable receiver type mounts. 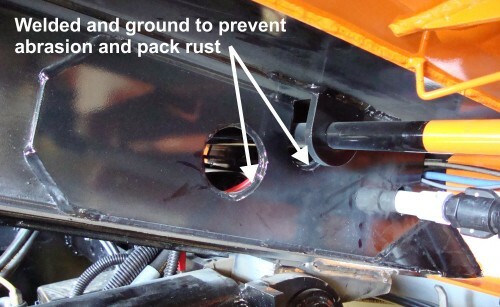 With the removal of two bolts, you can lift the entire hood assembly out of the holders to work on it at ground level, or perhaps put it on the shelf to keep it out of the way of damage on a hauling project. 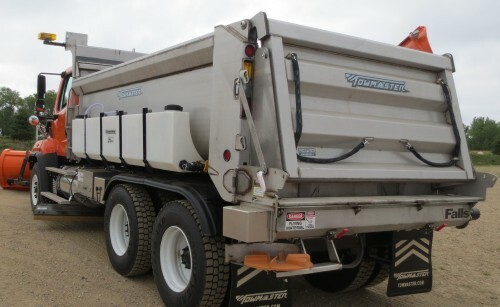 Towmaster’s 5-step prep/paint system ensures that you get a quality automotive-grade finish on your dump body. No orange-peel, but a lot of shine! 1: Body is shot-blasted completely (exterior & understructure). 2: Exterior is coated with a polyurethane (sandable) primer. 4: Polyurethane base primer applied. 5: Polyurethane paint top coat applied.